• This homogeneous assay involves simply adding a single reagent, the CellQuanti-Blue™ reagent, to the cell culture and measuring the fluorescence intensity (excitation wavelength = 530 - 570 nm, emission wavelength = 590 - 620 nm) after an incubation step. The CellQuanti-Blue™ reagent, like other resazurin-based assays such as the Alamar Blue reagent, utilizes the redox dye resazurin which is not fluorescent, but upon reduction by metabolically active cells is converted into a highly fluorescent product (resorufin). Living cells can readily reduce this non-toxic reagent and the resulting increase in fluorescence intensity can be conveniently monitored using a fluorescence spectrophotometer or plate reader. Nonviable cells have no metabolic capacity and, thus, will not reduce the dye. 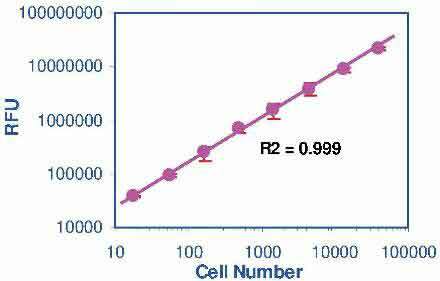 Therefore, the fluorescence intensity observed in this assay is a true measure of the viable cells. The CellQuanti-Blue™ reagent has been optimized for maximum sensitivity, reproducibility and long shelf-life. The homogeneous cell-based assay can be performed in multi-well plates. The reagent is compatible with all culture media and with all liquid handling systems for high-throughput screening applications in 96-well and 384-well plates. Applications include cell proliferation, cytotoxicity and apoptosis. 3. I am going to do the assay directly on the wells containing media and adherent cells. After the assay, I am interested to harvest the cells for IFA testing (recover of cells with trypsin digestion, then incubate with antibodies, then with FITC-antibodies, finally viewing under the microscope. Does the dye in CQBL absorbed by the cells? Will it interfere with the IFA viewing under the microscope?